Catalog: Stokoderm® Protect Pure Cream 100 mL tube. 12/Case. 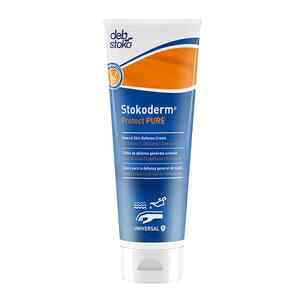 Stokoderm® Protect Pure Cream 100 mL tube. 12/Case. Designed for pre-work application, this skin defense cream protects against contact with water and non-water-based contaminants. It's perfume-free and non-greasy, too, and is compatible for use inside latex and nitrile gloves as a second line of defense. It also makes skin easier to clean. 100 mL tube. 12/Case.